Gorgeous outfit!! We love the skirt!! I love the pretty colors !Thanks so much for ur comment on my blog ! If you want we can follow each other on GFC ,Bloglovin/Facebook..Let me know ! Love this combo, you look geat! Superb color combination, I really adore that skirt! Thanks for dropping by my blog, and yes i followed you already on GFC ;) Follow back, yeah? I'm in love with your skirt!!! This blog is lovely. I love the shoes on this post. Thank you for the comment on our profile. We have followed you on bloglovin and GFC and it would be fab if you followed us also as you suggested. sure it would be nice to follow each other. thanks for your comment on my blog :) I am your new follower, hope you follow me back. Lovely Outfit <3 ,you look gorgeous! Hi! I love your style! I'm your new follower... i'm waiting for you! That skirt is absolutely gorgeous! Love the pleats! Как же мне нравится такое цветовое сочетание синего и желтого! Have a nice day! and my g+ for you!!! thanks for your visit on my blog and the nice comment! i would really like to follow each other! You look so adorable! The outfit suits you - and the shoes are so cute! I'm so glad I found your blog! I'd love to follow each other. Let's keep in touch! Lovely look dear! i love it! I follow you on google+ too! I hope you follow me back! Kiss! Love your skirt!!! Super Gorgeous!! Thanks for the lovely comment! Of course ill follow your blog its amazing!! Hope you follow back! Great mix of colours! I like this skirt so much! Hi, thanks for a visit, of course we can follow. Im your new follower, hopethat you follow me back. I love this look! You are gorgeous! I followed you on bloglovin, would you like to follow me back? You look so pretty :) Lovely skirt !! Una falda muy bonita, me encanta el color!!! Hey Lena :) cute outfit - love the bright colours. You look just like Snow White! A while ago I wanted to do a Snow White outfit but couldn't find a perfect skirt from anywhere, however yours is absolutely PERFECT :) Love this outfit! I love the shoes! It looks great with the whole outfit :) thanks for the comment on my blog, I'm following you, hopefully you do too! Love this bold colour combination, it works beautifully. the skirt is sublime! Beautiful color combination, it looks great against those wood doors. I really like how the pleats in the shirt bring out the pleating in the skirt. You have an eye for detail! Love your blog and the awesome post. Would you like to follow each other? Drop a comment on my blog and I will follow you back! Thanks so much for following my blog ! following u back..stay in touch ! Lena, this outfit is so pretty! Мне так нравятся цвета! Красиво! aww lovely combination! :D yellow and blue klein is the best! of course we can follow each other on GFC, but i dont use blogloving! Of course that we can follow each other ! I'm already following u via GFC, Google +, and bloglovin #409! follow back?? love the sandals and skirt! Love the colours on you love. Following now and hope to hear from you. Love the color contrast! Blue and yellow together is one of my all time favorite combos! Красивое сочетание желтого с синим! Милая обувь в цветочек! I adore your skirt, the colour is beautiful! i'm very much in love with that pop of colour! blue and yellow are a very nice combination. i also love orange and blue very much, because that's a complementary contrast. maybe you should try it too? following you via bloglovin and gfc my dear. Cute look! Reminds me of snow white! Hehe. 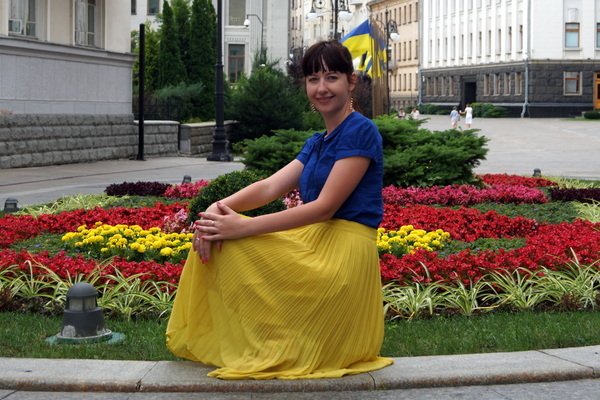 wow your outfit is amazing, the blue and yellow reminds me of snow whites dress, love love love, great inspiration! love the first pic! oh what a beautiful look darling! i love this bold colors! it looks amazing! omg! You look so beautiful! those clothes are very very pretty ! Thank you so much for your lovely words, I really appreciate and of course we can follow each other ^_^ ! Beautiful outfit! So incredibly chic! love the pleated yellow skirt and those shoes are beyond adorable...so pretty. I love the yellow skirt! IT is sooo perfect! Ах боже ж мой! пошла вниз по остальным образам: а тут просто цветовая феерия!